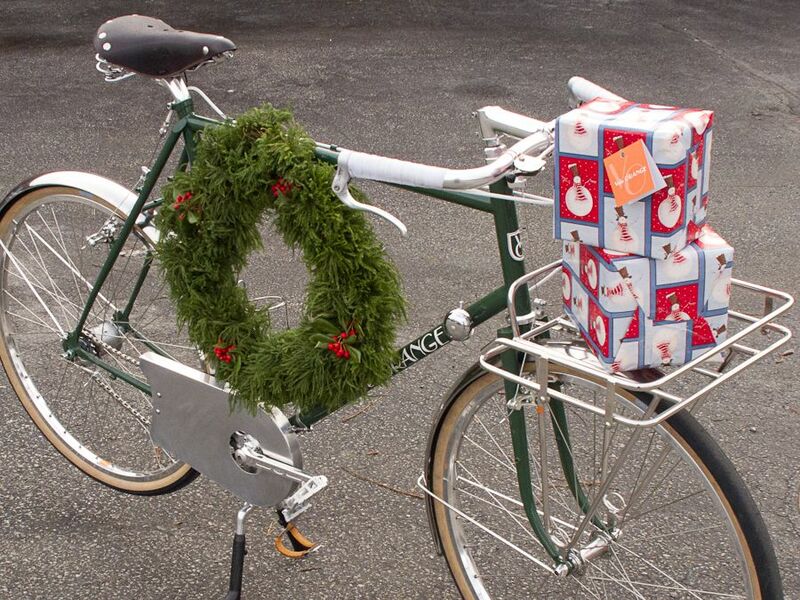 All of us at Velo Orange want to thank our customers for another great year and wish you HAPPY HOLIDAYS. We've lowered the threshold for free shipping to $25 from midnight tonight through Thursday. The usual rules apply, orders must ship to the lower 48 states, frames and wheels not included (due to their size). We're also offering 20% off on everything picked up at the VO showroom Monday through Thursday of next week. But, remember, our little showroom is only open from 10am to 4pm. It's at 1819 George Avenue Annapolis MD, 21401. Also, we'll be closed the week between Christmas and New Years. You're welcome to place orders through the store site, but they won't ship until Jan 2nd. And there will be no one here to answer phones or e-mail that week. 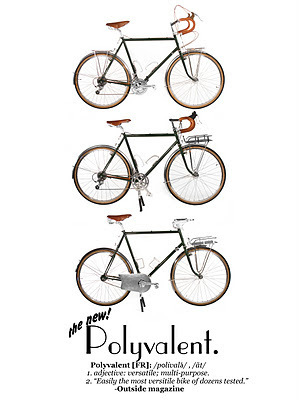 The Polyvalent comes with minimalist decals. A lot of folks like this simple look, but others prefer more traditional contrasting-color decals. 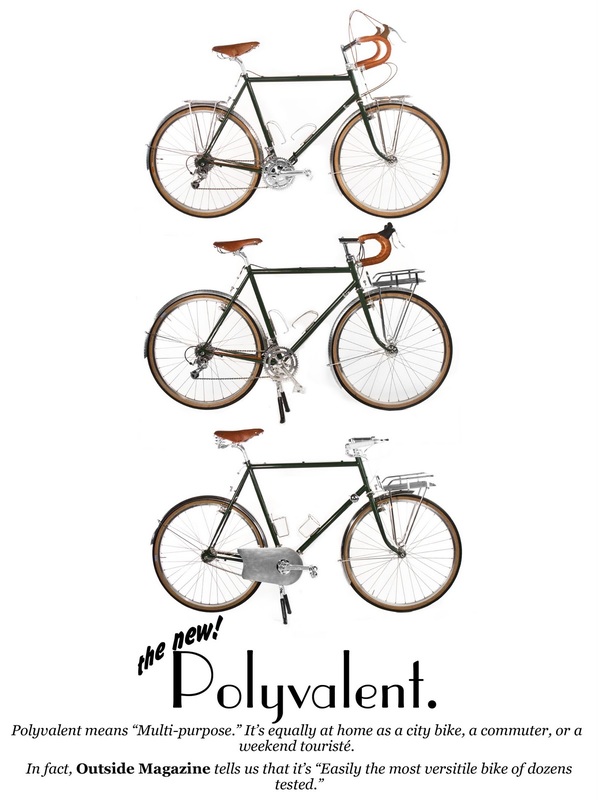 So when you order a Polyvalent frame or build kit we give you the option of getting a set of white decals. Here's a video that'll show you how to apply them. The same technique works for most other modern bike decals. You can even get get custom made decals (just Google bike decals) for restorations or to personalize your frame. 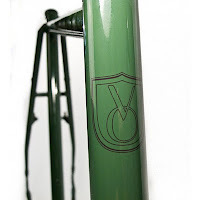 Applying decals from Velo Orange on Vimeo. 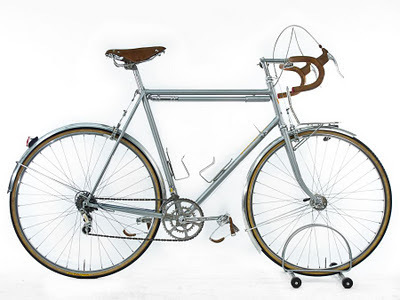 Back in the day, when we rode 5 or 6-speed freewheels, we would change freewheels to suit the terrain. A flat criterium meant fitting a "straight block", 13-14-15-16-17-18. On a mountain ride we'd fit a wide range freewheel, maybe 14-32. We serious riders also had a couple of in between freewheels, or even loose cogs to build our own custom freewheels. 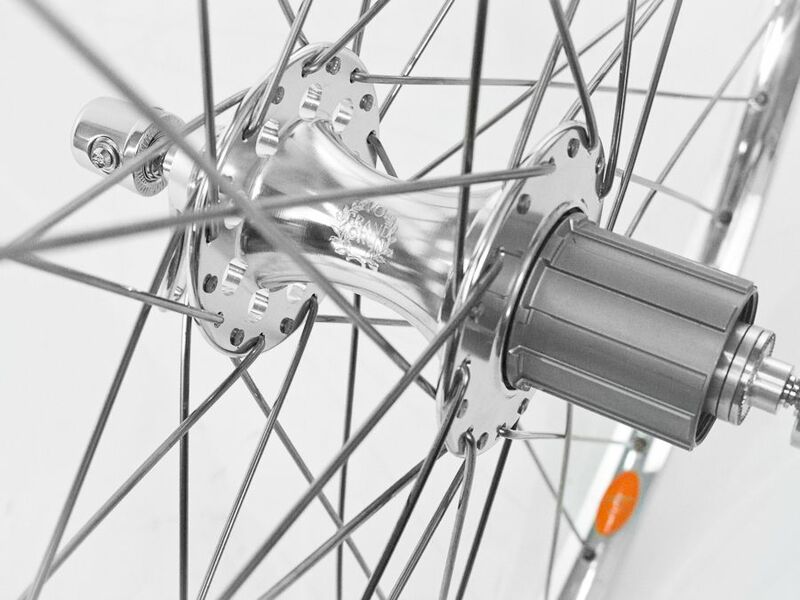 Fun with Freehub bodies from Velo Orange on Vimeo. All you need is a spare freehub body and another cassette. 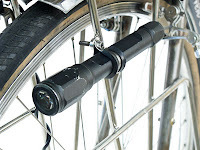 You can even switch cassettes between a 130mm spaced hub and a 135mm spaced one. Or pull the cassette off to replace a broken spoke. I thought some of you might like updates on the various VO projects I'd mentioned previously. We've been testing different forks for the Polyvalent 700c/Camper frame. We even figured out how to re-rake our own forks. I think we've nailed down the geometry and we'll approve production very soon. The Pass Hunter 700c performance frame is up next for development. We hope to be testing prototypes in a couple of months. We're awaiting new prototype camping racks. I know these have been in the works for a long time, but we do want them as close to perfect as we can manage. Since the prototypes are all bent, welded, and finished by hand it takes 2-3 months to get each new generation. We've rethought our luggage projects and are designing a new line of premium bike luggage using the best fabrics we can find. 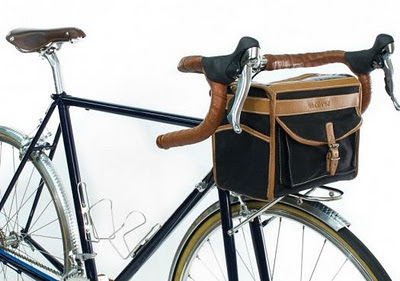 I think we've found the right material and come up with a pretty darn nice handlebar bag design to get the line rolling. Now we'll enter the long prototyping stage. These will probably be called Grand Cru bags. Our first round of short reach/drop bar samples was disappointing. We have to make new tooling and try again. I'm really particular about bars and am finding that getting the hand positions right is much harder on these than on medium or long reach models. 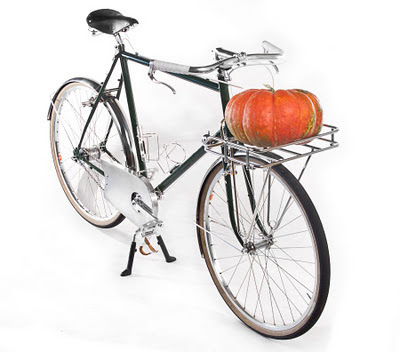 We hope to introduce complete, ready to ride, bikes this winter. We're kicking around the idea of a 26" expedition bike, something halfway between a mountain bike and a traditional camper. 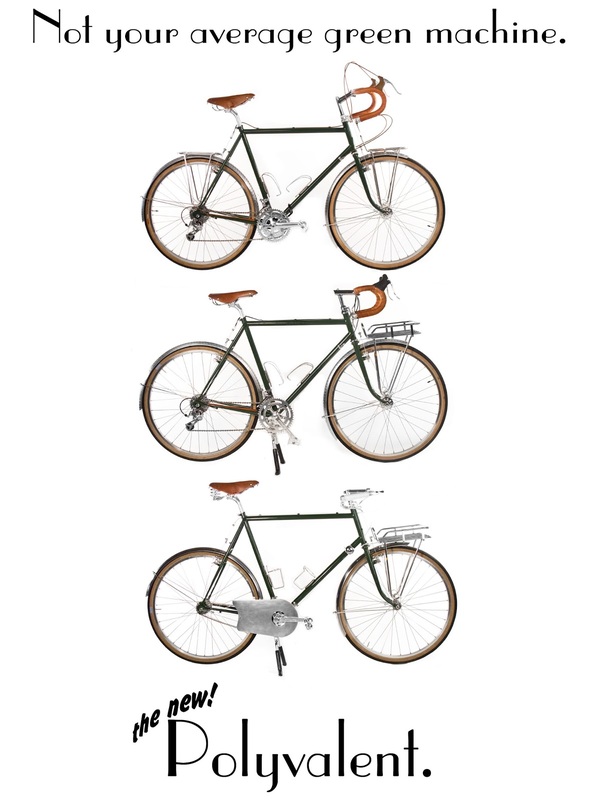 A larger porteur rack is possible, but how big? Need to haul cases of beer, pizzas, large paintings, sheets of plywood? 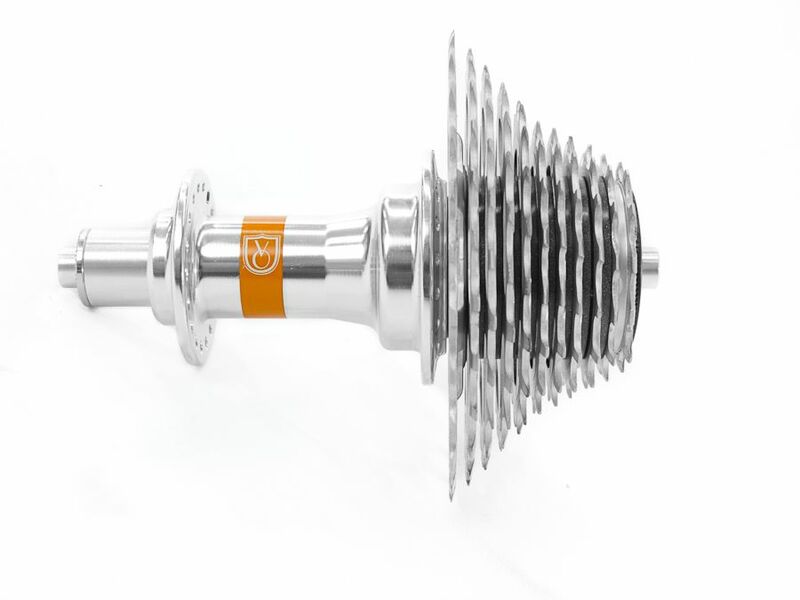 The Campy versions of our Grand Cru touring and VO high-low hubs have arrived. Many Campy fans, myself included, have been waiting for these. They are available on all our hubs and on all VO rear wheels. 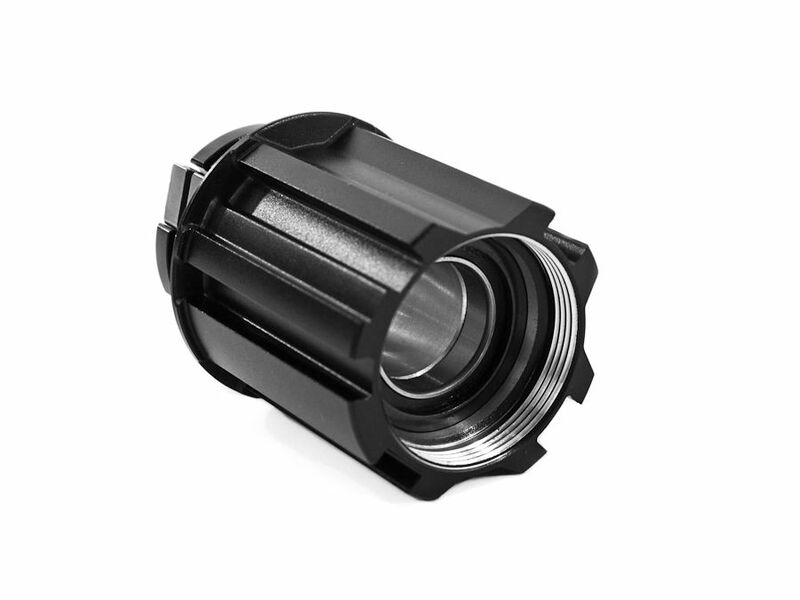 We also have the freehub bodies available separately so you can slip them onto your existing wheel. It only takes about 5 seconds, and no tools, to switch from Shimano to Campy compatibility. I know that some of you don't get the appeal of Campy products. And I have to admit that I don't notice much diffidence in performance between Campy, Shimano, and Sram. 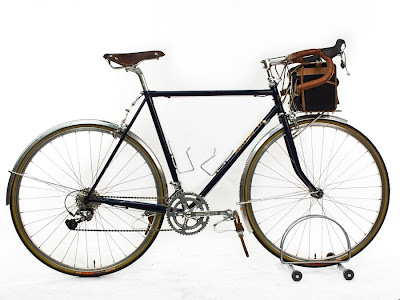 But many of us really love the Campy brifters, still the best ever in my opinion. I also like that many little internal parts for Campy derailleurs and brifters are available. I can rebuild stuff instead of replacing it, or convert 9-speed brifters to 10-speed. Finally, I like that front shifting is non-index. Just a note about one other compatibility issue. 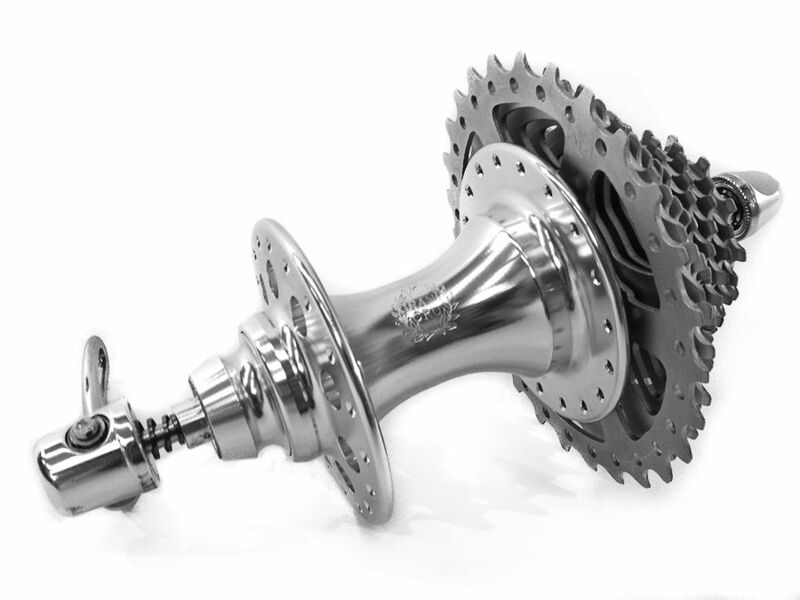 All of our cranks work with 5 to 10-speed, be it Campy, Shimano, or Sram. 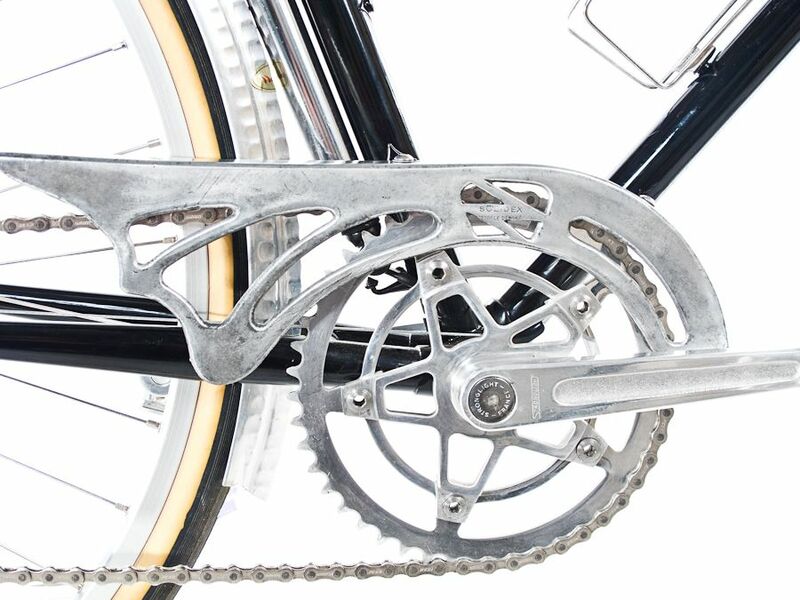 They should also work with 11-speed, but we have not tested that since none of us ride 11-speed yet. 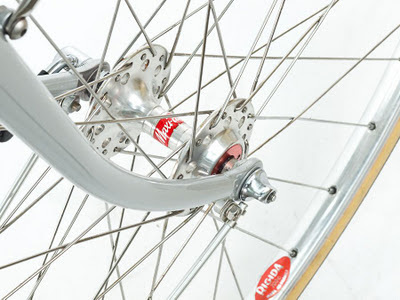 Update: It looks like these will work with 11-speed on the high-low hub, but not on the high flange touring hub. The higher flanges cause the spoke ends to rub the innermost cog on Campy 11-speed cassettes. We have a new offering in our Prototype and Specials section. 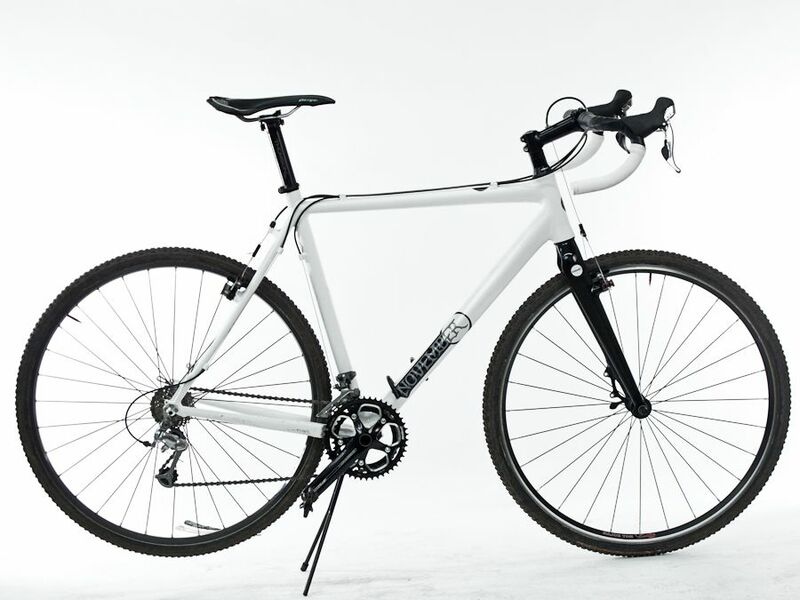 It's a complete 57cm VO Rando with a Shimano 105 10-speed derailleurs and brifters. 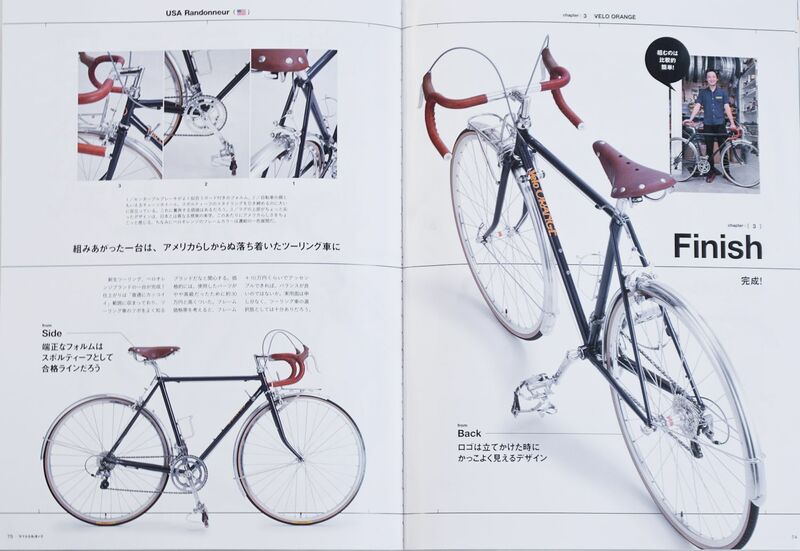 This bike was used for testing and a magazine review and has very very few miles on it. It's $2000 including the rack and front bag; considering that the maxi build kit $1220, that's a pretty great deal. 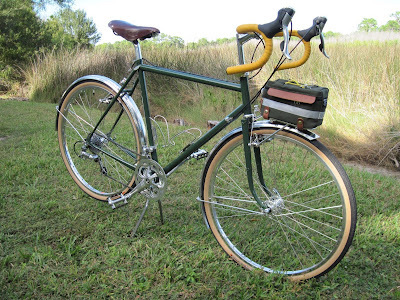 It would make a wonderful fast randonneur or credit card tourer. 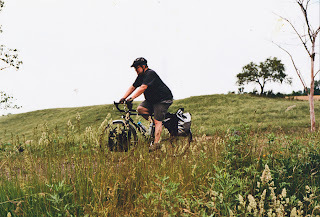 It’s been a bit more than a year, the calendar says, but it seems like just the other day that I shoved off from home with gear on my bike and dreams in my head. I just got my photos back, and that brings it all into focus again. I’m reminded that I wouldn’t have seen these sights or met the folks I did if I hadn’t been inching my way a few thousand miles down the coast. What I’m left with is a confirmation of what the bicycle is and can be. It’s a tool for going from “A” to “B,” some will tell you. Or it’s a toy for zipping around on the weekend. Or a piece of exercise equipment. Or maybe it’s a different way of thinking. You can hop on and head towards “B,” but all along the way you’ll get to do something magical - you’ll get to bump around through life and experience all of its little joys. 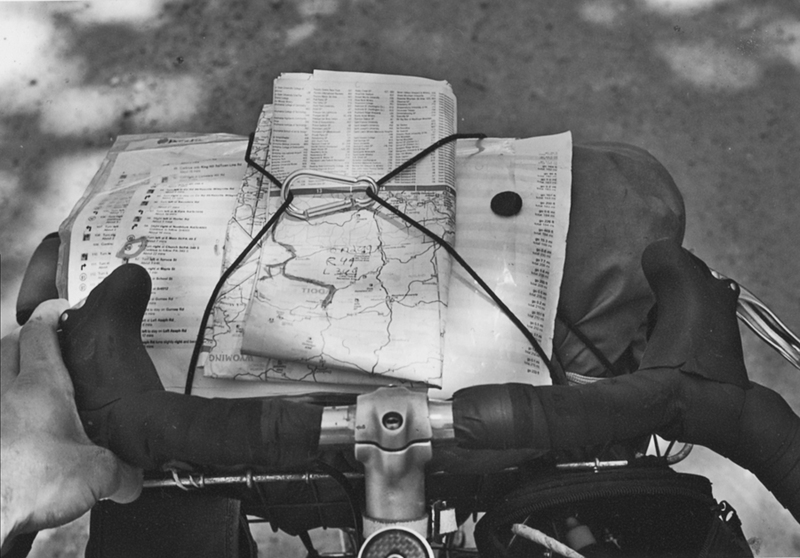 The bicycle is a tool - a tool of discovery. And it’s a toy, a magical thing that makes adults into children again. Exercise equipment? An exercise in life. 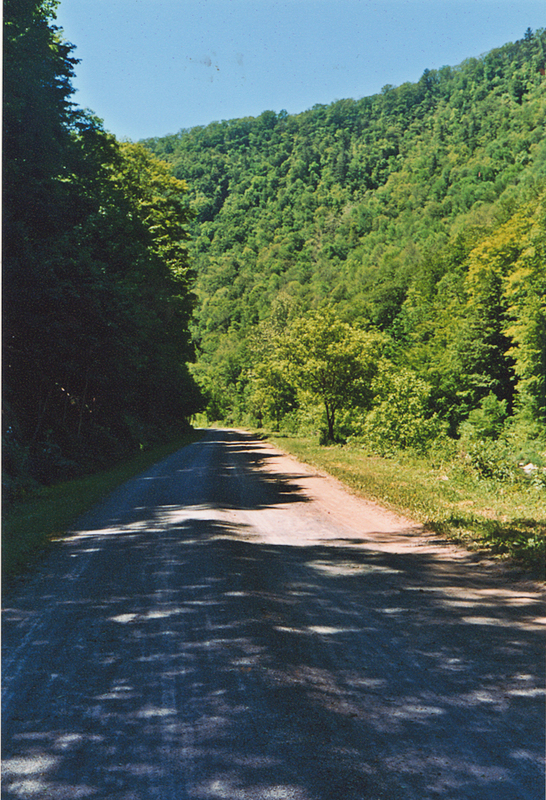 You can head out for a weekend or a week, and stick to the dirt roads, state forests, and country lanes where it’s quiet and there’s little traffic. Maybe you’ll find yourself on an unpaved track in the backcountry where you can go at your own speed and be contented with your own thoughts. A sensible bike will let you put on some bigger tires, for comfort, racks for your stuff, but then the rest is up to you - go have fun! 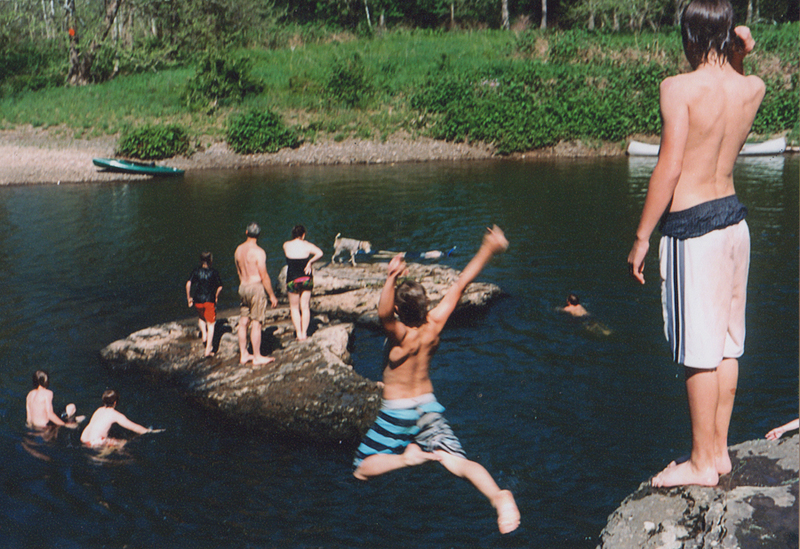 When you're out rambling, you don't need much to stay happy. As I made my way I learned about what I needed and what I didn’t. Cue sheets don’t help much when you’re going almost 3,000 miles and like to follow wrong turns and ride down bike paths. Each gas station in each state you go through has a huge folding road map for only a few dollars. These helped me get lost a little bit more, and ride up big hills I didn’t need to, and encouraged me to go West when I wanted to go East, and visit parks I might have missed otherwise. 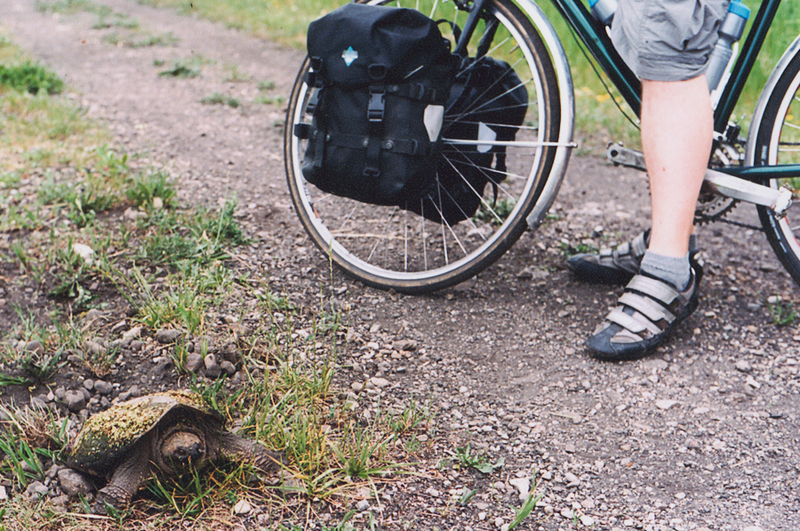 The bike paths were some of my favorite riding. It seems that deer and hawks and turtles come from all around to enjoy the little bit of woods in the suburban sprawl. 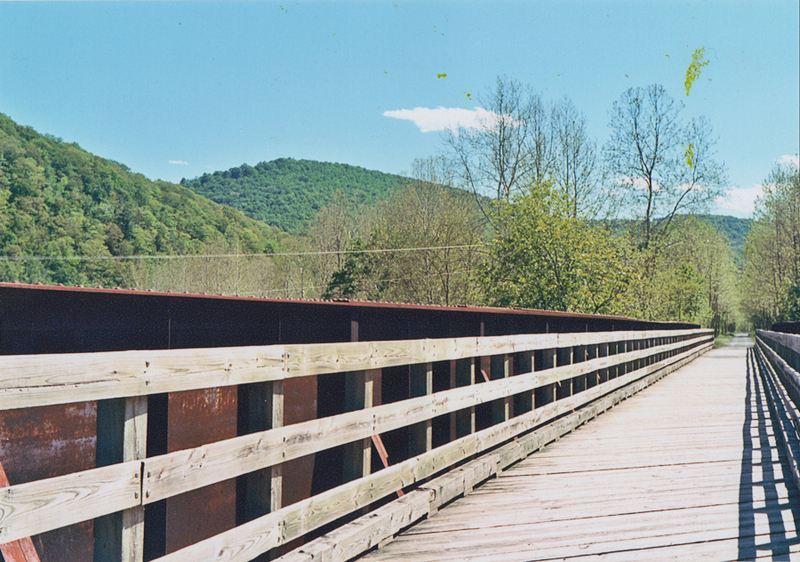 Bike paths connected me to friendly folks, swimming holes, icecream stands, and great camping spots. 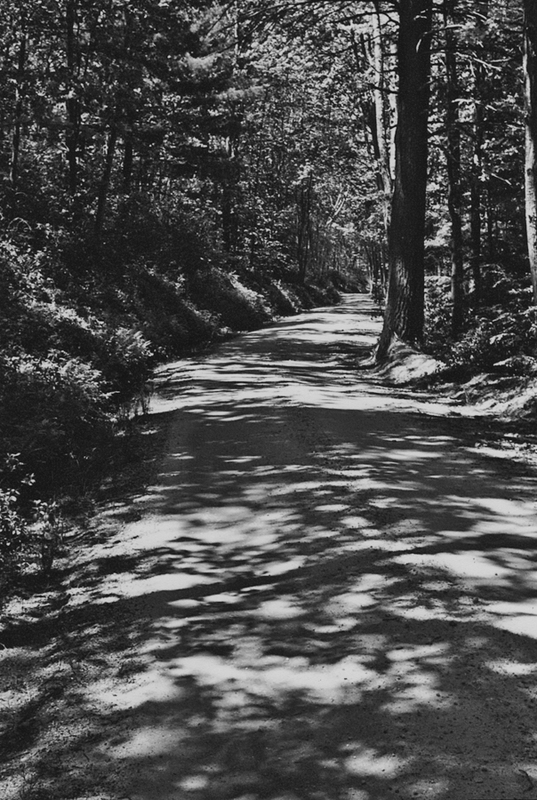 Life on the bike really was life without a schedule, where I could nap and read under a shade tree in the heat of the day. I crossed Western New York from North to South, and wondered how towns like “Cuba” and “Nunda” extracted their names from the nearly-Canadian so-far-north, glaciatic terrain of Upstate. Soon I crossed into Pennsylvania, got a new state map, and tried my best to get lost in a maze of forest roads. 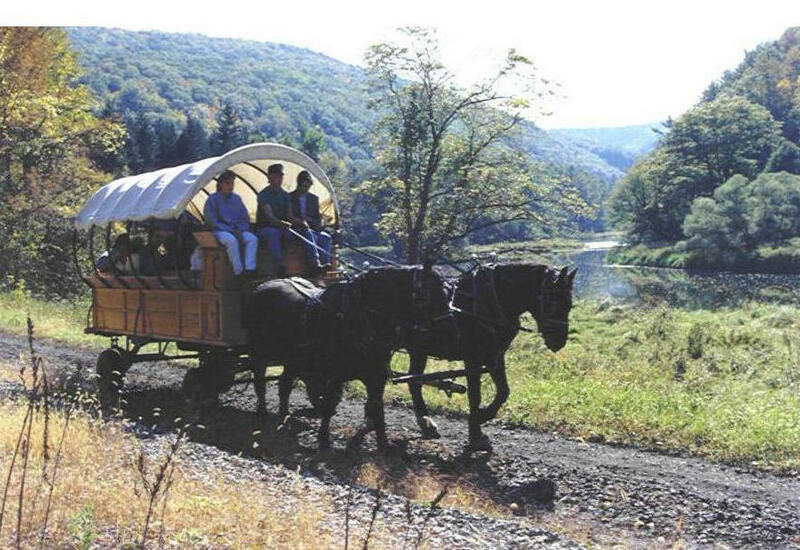 Susquehannock, Tioga, State Game Lands this and that, and the Pine Creek Gorge. The trail is a strange mix of old and new, and I drew my water for the day from springs alongside while tourists in enormous traditional covered wagons rolled past joggers and mountain bikers. 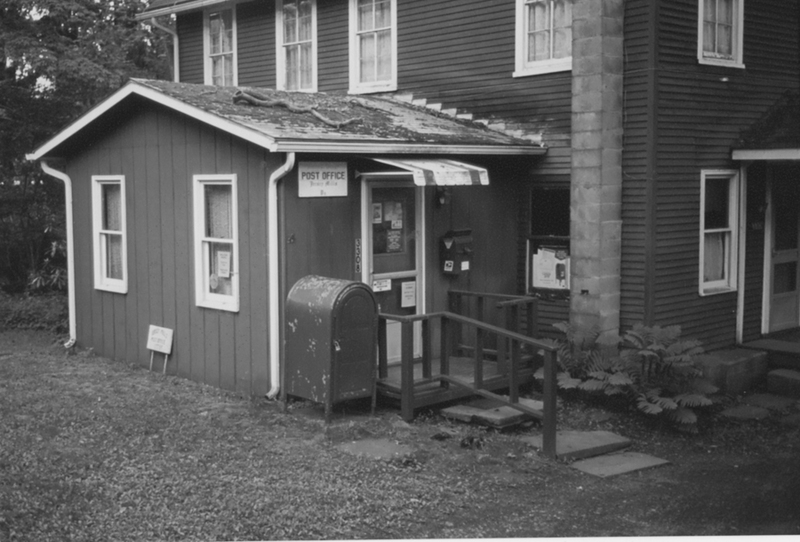 The town of Jersey Mills added to the charm - its post office was connected to what was almost certainly someone's house. The post office was closed, but I dropped my letters in the box and kept going. And along the way I learned to ask for directions. “Anyone seen Williamsburg? It’s over there somewhere, right?” It’s fun to let on that you’re completely lost, especially when you are. 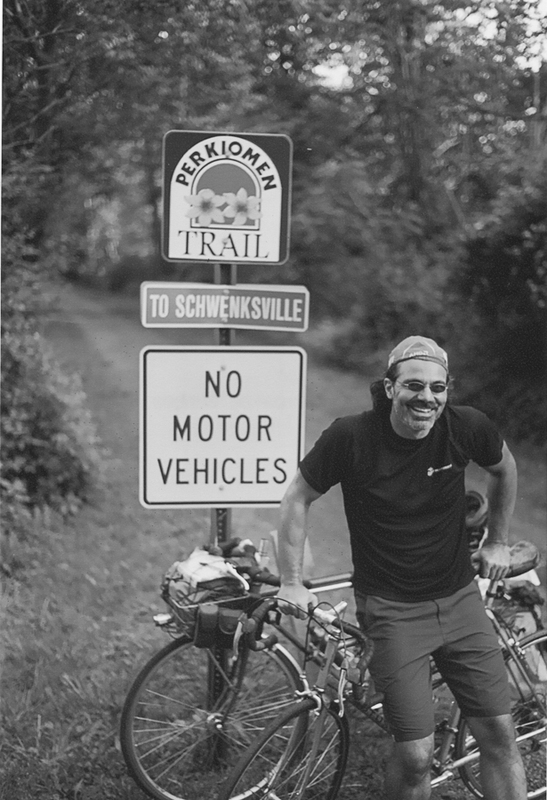 This guy showed me to the trail that would be my secret highway into Philadelphia. Some of the prettiest secret entrances to huge cities are via bike paths that follow big rivers. 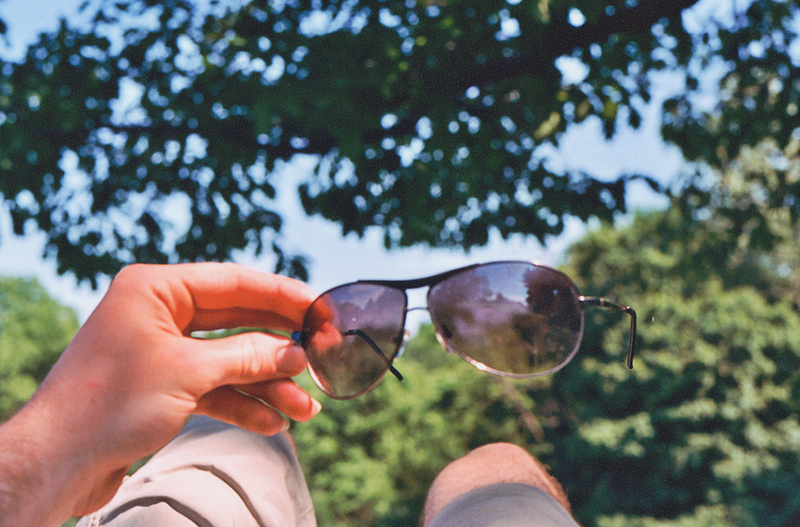 Way better than sitting in traffic. I can’t recall his name, but he was a spirited rider and had been enjoying his bike so long that the toptube was rusted through in one spot, from sweaty summer afternoons. I hope he’s gotten a new bike by now. Zigzagging to Philadelphia brought me to a weekend of reconnecting with friends while the Flyers missed the Cup by just a hair. Philadelphia was not happy about that, and I escaped up the Schuykill River trail and then across to York, and followed the NCR trail through the towns of Railroad, New Freedom, and Freeland. 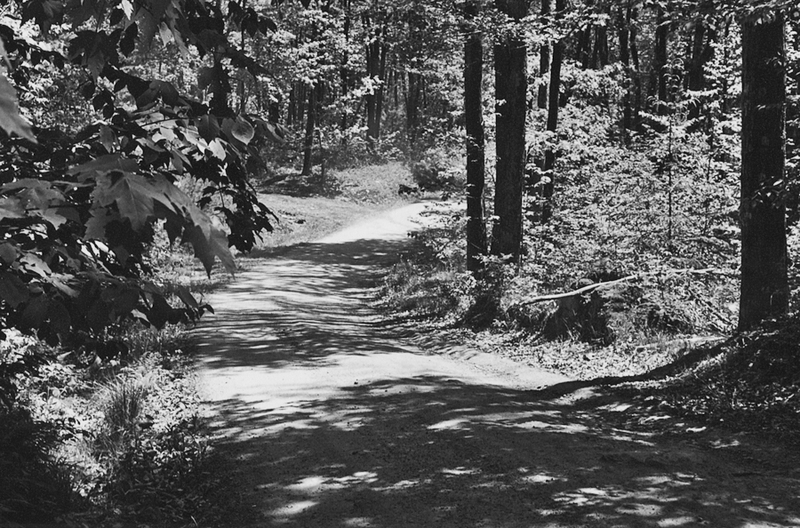 Before I knew it I was on the Jones Falls trail, an amazing part of Baltimore that could be anywhere, a serious part in the middle of a busy city. Virginia is a blur of long rollers, but then the flat, calm Outer Banks of North Carolina leave a lasting memory. I’ve been back to ride this section a couple more times. It’s very strange to find yourself so surrounded by water, but riding a bike. There’s parts of Hatteras less than 500 feet across, and it’s all sand dunes. Just a long flat road all to yourself, and a nice campground at the end of it. There’s few bad places to ride a bike, but this might be one of my favorite, if I had to choose. After landing in southern North Carolina, and attending my sister’s beautiful wedding, I set off on another adventure. Maybe we can talk about it next time. Until then, who’s got stories to share? Been somewhere neat? Want to go somewhere soon? As we've done in past years, we're offering a free shipping deal during the holiday season. This offer started today and runs through January 1, 2012. The free shipping is offered only on orders shipped to the continental USA. The order must be over $100. 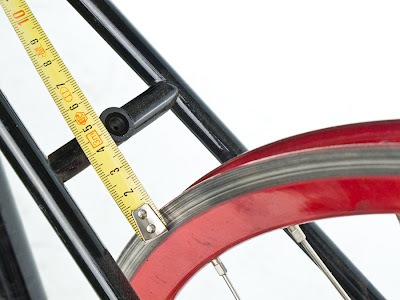 Frames and wheels are excluded due to their large size and, thus, higher shipping cost. We have a new section in our site called Prototypes and Specials. 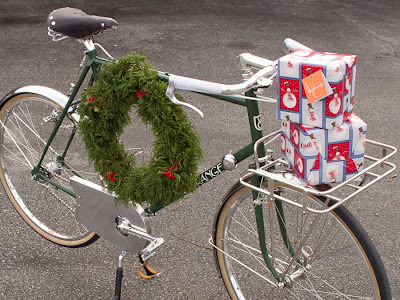 We'll use it to list some of the frames and bikes we've previously sold at our garage sales. 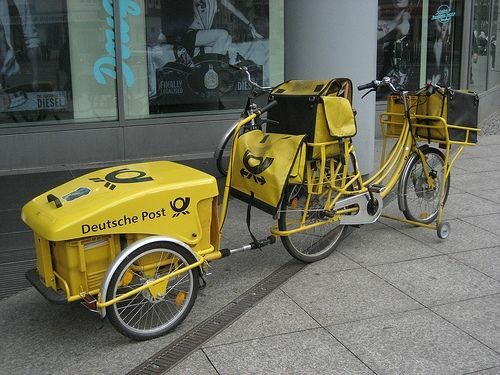 These may be prototypes or display bikes or bikes sent to magazines for reviews. We may also have the occasional new frame with scratched paint or some other small flaw. There are two rather nice bikes in the category now. Both are bikes are prototypes that I rode for awhile, but no longer use. The burden of this job is that I can have more great bikes than I possibly need, and at the same time I'm trying to own less stuff. 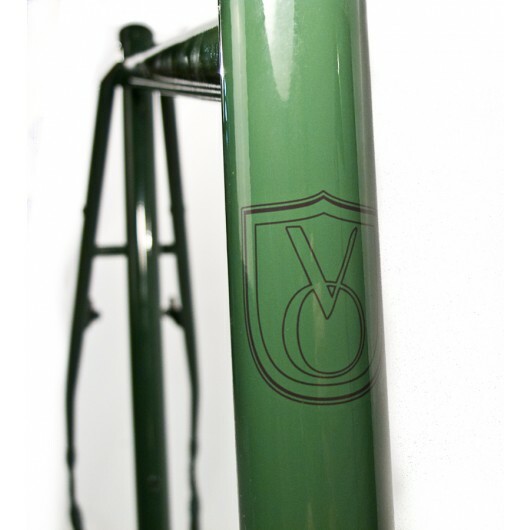 The first bike is the prototype of the VO Rando frame. This was a bike I rode for about a year, but no longer do. The ride is absolutely terrific and very similar to the Pass Hunter I now ride, but I prefer the pass hunter. Johnny Coast did a really fine job on this frame (He was trying to win our semi-custom frame business, which he did.) The Rando has a great selection of new-old-stock French components. It even has Maxi-Car hubs. 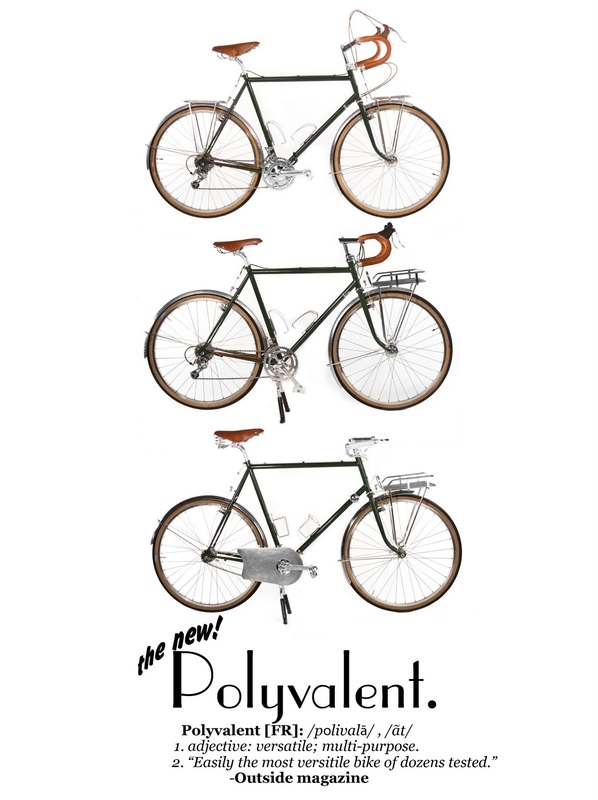 The second bike is the prototype VO Gentleman. 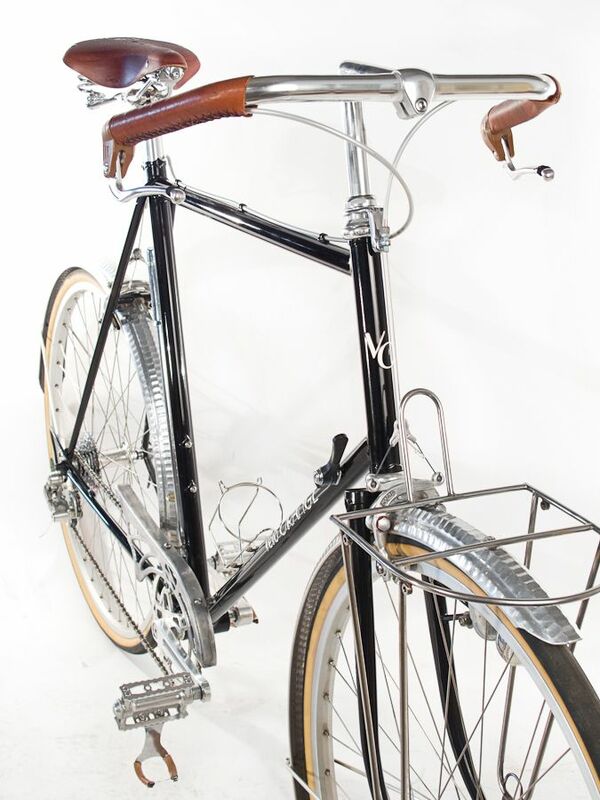 This was a semi-custom frame we offered in our early years. It was built by Ahren Rogers. The frame is fillet brazed, has bosses for a chain-guard and a single down tube shifter. The build is a mix of classic and new components. 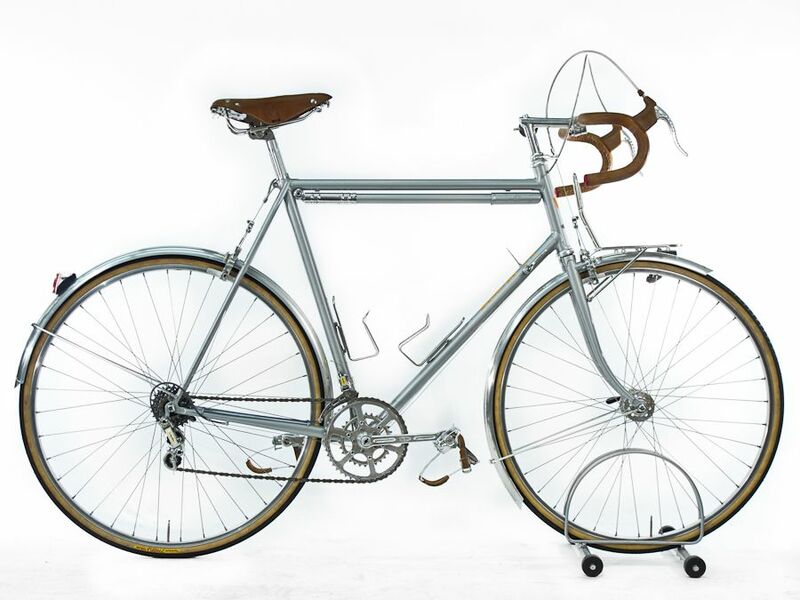 This would make a great commuter or classy around-town bike. Update: The rando is sold. 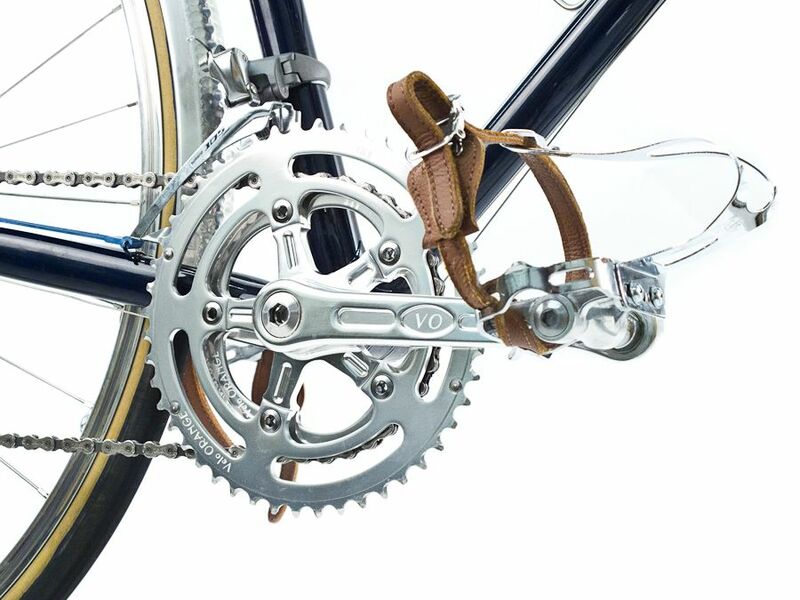 Also, the derailleur on the Gentleman is a Simplex SX610, much nicer than the model 404 I'd incorrectly listed. 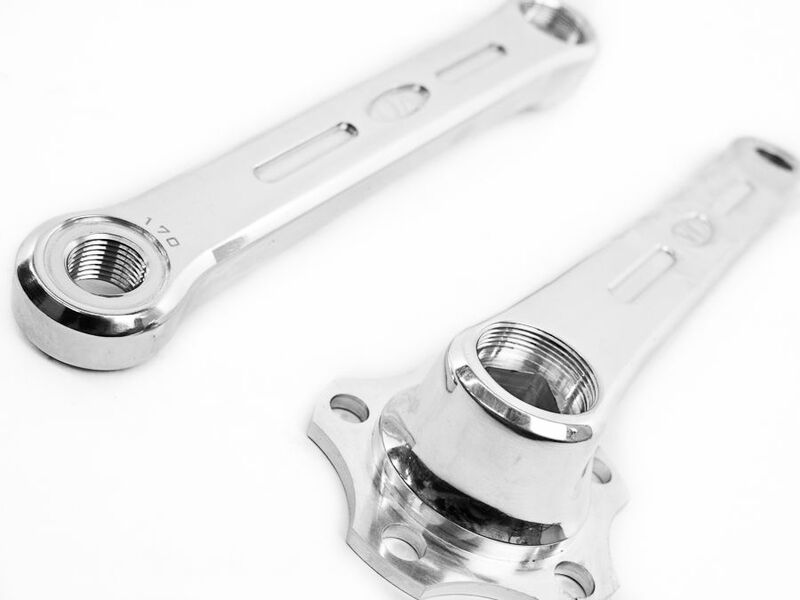 We also have 50.4bcd bare crank arms which many of you have asked for. They come with BB-bolts and dust caps, but no rings. I only announced them on my own (not VO's) Twitter feed yesterday and they have been flying out the door since. An impressive number is going to shops in Japan. We also have single ring hardware kits for 50.4bcd cranks. 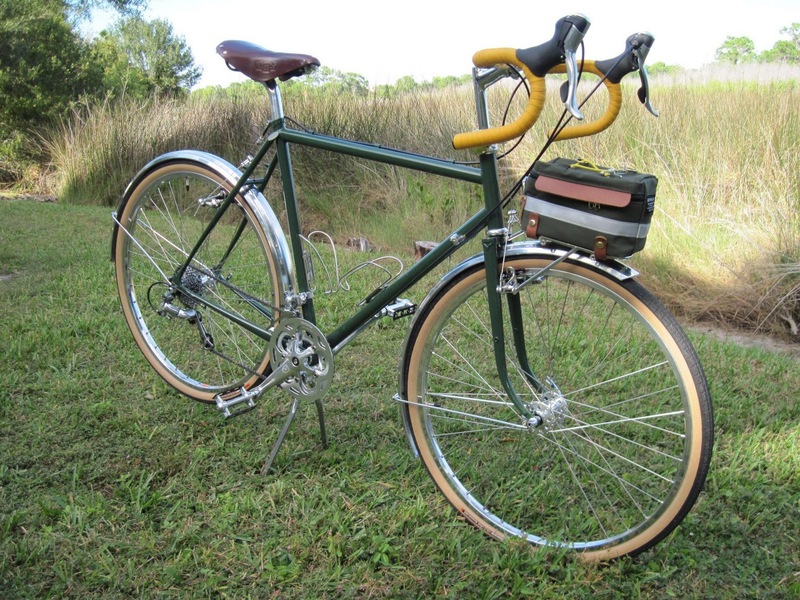 Here is a very impressive transformation of a 1985 Trek 620 into a lovely city/all-arounder bike. Of course a lot of VO parts were involved. You don't need to buy a brand new frame to build a great bike, (yes I know we sell frames). Good job, Justin. The one thing that's typically missing on these sorts of transformations is low-trail geometry. But it is possible for a frame builder to re-rake a steel fork, sometimes without even damaging the paint, should you really want low trail. 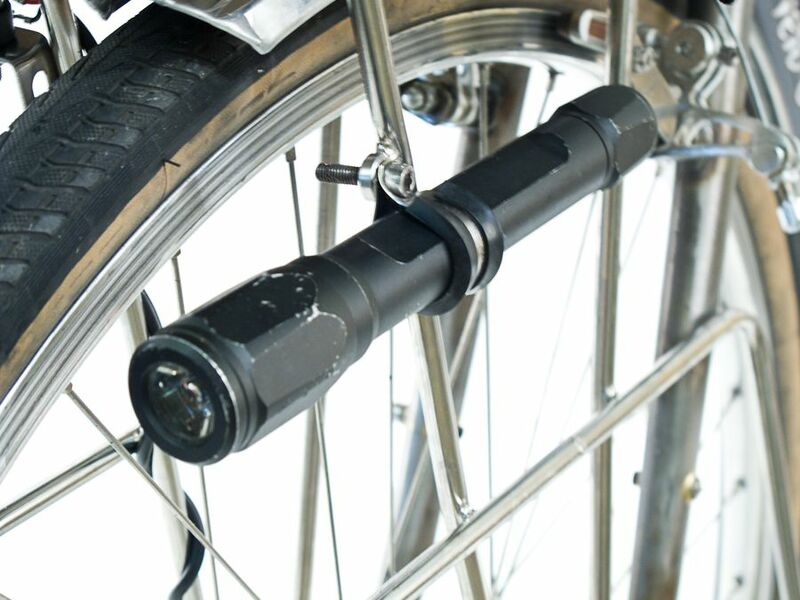 We were talking about flashlight mounts recently and I just noticed this on Robert's bike. P-clamps do make fine flashlight mounts. I remember well when we announced that our first business, Chesapeake Light Craft, would be taking credit cards in addition to the checks we'd always accepted. We immediately received a hand-written letter decrying our defection to the dark side; we could just see the writer tsk tsk-ing, shaking his head sorrowfully. A tiny boat design business accepting credit cards back then was a pretty major step. Twenty years later, running another niche business, we maintain a powerful e-commerce platform (except when it isn't) and don't even accept checks anymore. Despite all the program features and the data that we command – excluding credit card info, to which we have no access – there are just some things that we never considered doing, simply because we don't want it done to us. We're the types who e-shop only when we need something, most likely yesterday. We expect a confirmation and a tracking number, but any other communication from the vendor is spam to us. And local businesses usually don't get our e-mail addresses or our phone numbers. In a recent relaxing of the guard, however, I joined the email list for a local specialty food shop. If I hadn't then I wouldn't have received an e-coupon for a free crusty baguette or known of the line of soups that the shop prepares daily. I didn't need either, but I'll remember them when I do (well, OK, I rushed out to get the baguette). Hence our questions. Would you appreciate receiving e-mailed promo offers and single-use coupon codes? Or would they become spam and keep you from ever shopping with us again? And before you ask: yes, you could opt out, and no, we don't divulge any of your information to anyone. What would you do with VO coupon codes and special offers sent by email? 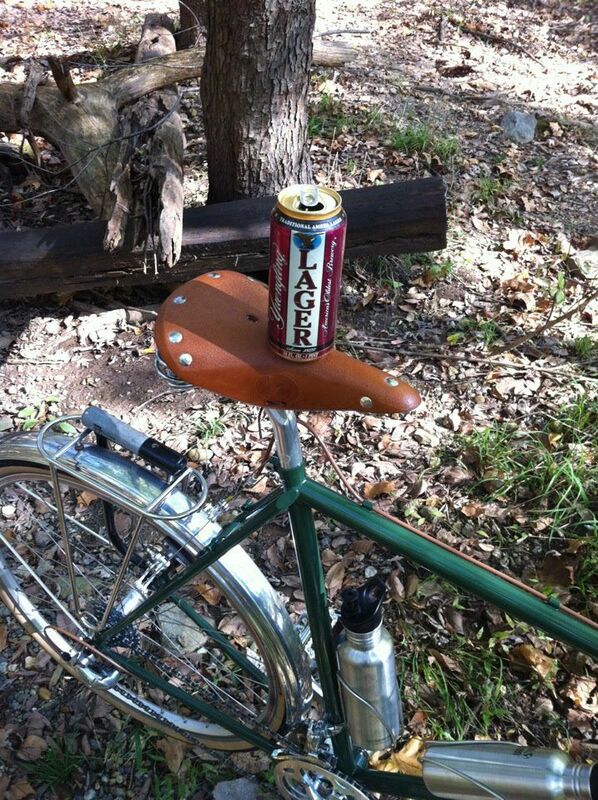 Ari has neat place to store a bike lock on his Polyvalent, as well as good taste in beverages. Debra's Polyvalent looks like a very comfortable all-arounder and has lots of VO parts. 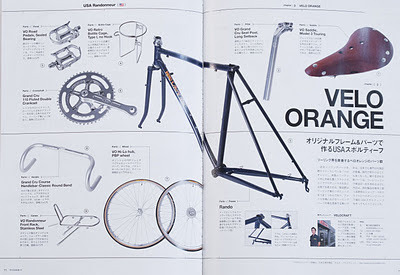 Those Polyvalent wide-range cranks are also getting popular. Robert is VO's buyer and resident cyclo cross racer. This is his new race bike. Not much VO-style stuff on this one, save our hi-low rear hub. Have a new build? Leave a link in the comments. We've been thinking about the possibility of making Grand Cru pedals these past few weeks. Our idea is for two versions. The first is a double sided pedal with a large platform almost like a BMX pedal, but with great bearings. 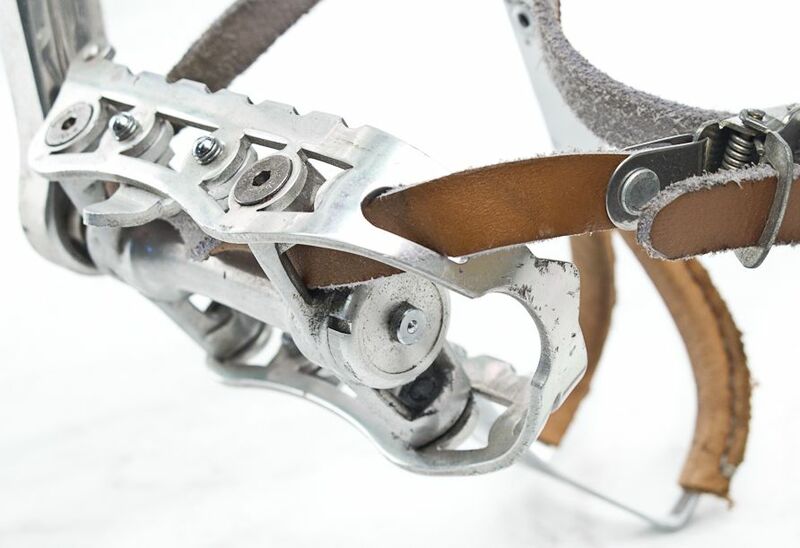 The second is a single sided version with a flip tab intended primarily for use with toe clips, but designed for street shoes rather than stiff-soled bike shoes. We want them to be reasonably light, not desperately expensive, and with very long-lasting bearings. We've explored the idea of a spindle with three sealed bearings and another with a combination of needle bearings and sealed bearings. A grease port is another feature we're looking at. Maybe something like a super-premium version of the VO touring pedal. What would your ideal pedal be like? Single sided or double? Is it worth paying more for a super-durable bearing system or is it better to just keep re-building cheaper loose bearing pedals. And do you find quill-style pedals uncomfortable with street shoes? Also, please see the update to the last post for the winner of the brake name contest. These are our new low profile brakes. They have a really long lever arms for amazing stopping power. 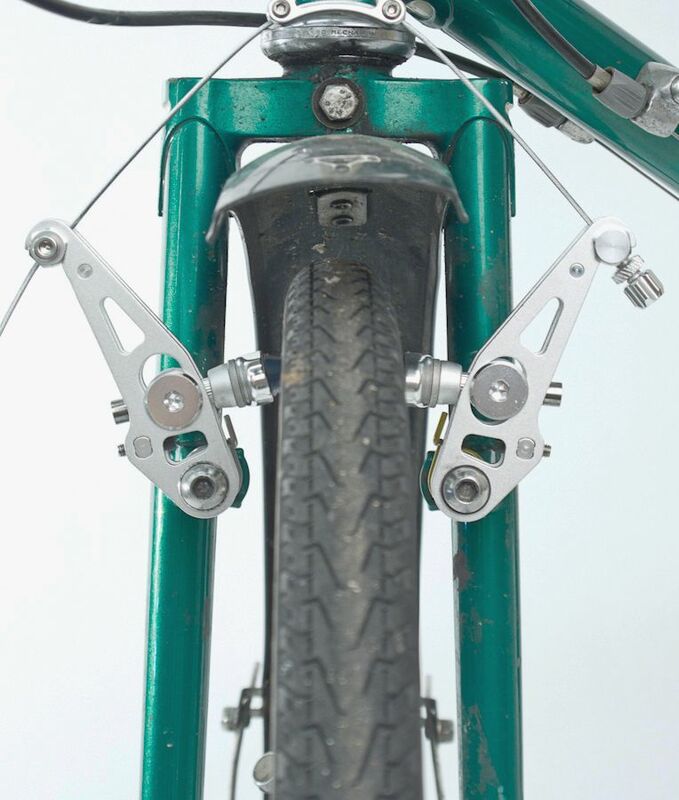 Remember the old Mafac tandem brakes, these are like a low profile version with a lot more adjustment. The same basic design is being used on some European pro-racer's cross bikes. 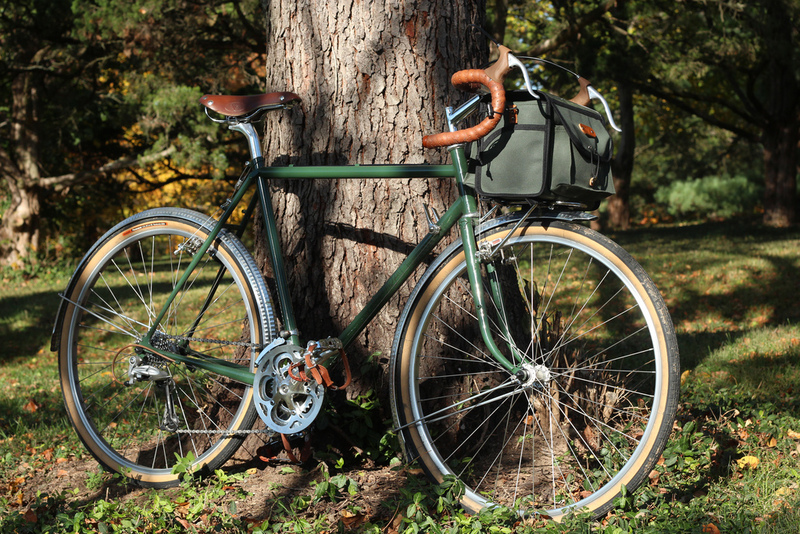 We think they are perfect for loaded touring, tandems, or for really big riders. 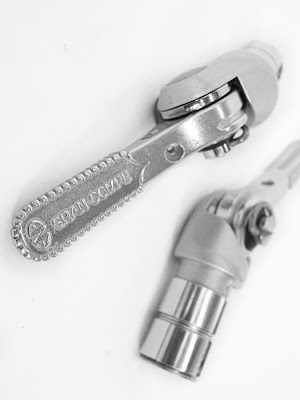 Unlike V-brakes, they use regular brake levers. 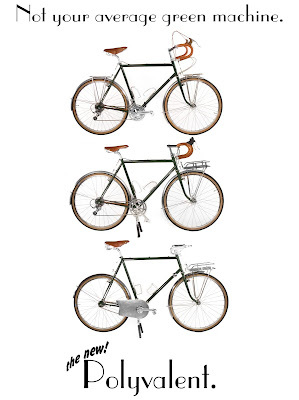 So you can use your favorite classic levers or non-classic brifters. They have tension adjustment screws and a straddle wire adjuster. They even have slots so you can move the pads up-and-down about 15mm. And they come with toe-in adjustable pads. About the only feature they lack is a good name. If you come up with the name we use we'll offer you a $100 VO gift certificate. Put your suggestion in a comment, but remember to use your name so we can identify the winner. BTW, the high profile Grand Cru MK2 brakes are not being discontinued. In fact, they've been selling so well that we ran out again. Update: Thanks for all the great suggestions. It took a lot of time and more than a few laughs to make a choice. Eventually we picked "Zeste" as in "Velo Orange Zeste". Greg, please send us an e-mail so we can issue your gift certificate. Calvert sent us this photo of a rather clever use for a VO handlebar to bottle cage mount. The photo explains it perfectly. I might add that with a VO or Nitto rack you could screw it to the light boss and eliminate the p-clamp. 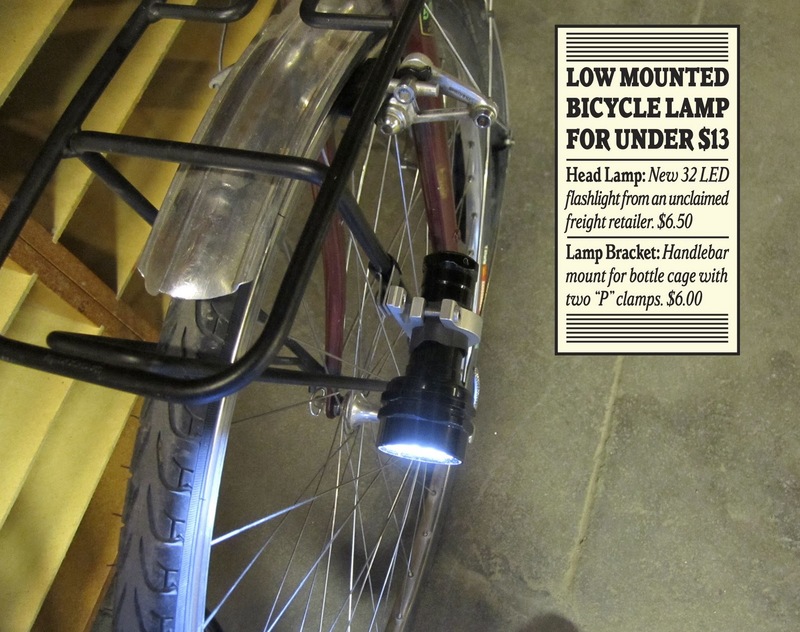 LED flashlights seem to be getting better and better and also cheaper. 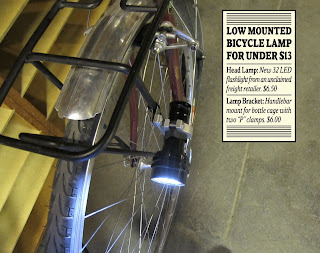 It might be time to finally resurrect the long discontinued VO flashlight mounts. Anyone else have clever hacks to share? We get occasional requests for 27" rims or wheels. It wouldn't be hard for us to make 27" rims, but I don't think it's a good idea. Converting old 27" bikes to 700c is simple and almost always my preference. 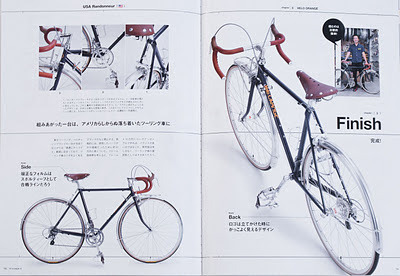 A bit of background; 27" wheels were used mostly on American market mid and lower-range production bikes. There are some exceptions, but top-end frames with 27" wheels are relatively rare. 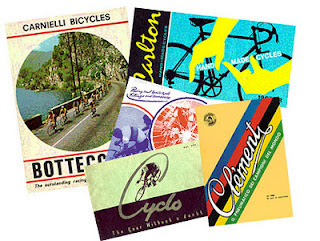 The popularity of 27" wheels waned in the late '70s or early '80s when 700c became the near-universal road bike size. Today there are few choices of good quality 27" rims or tires and I don't know of a single new bike that still uses that size. The main reason to switch to 700c is to gain access to many more high quality tires and rims in more widths. 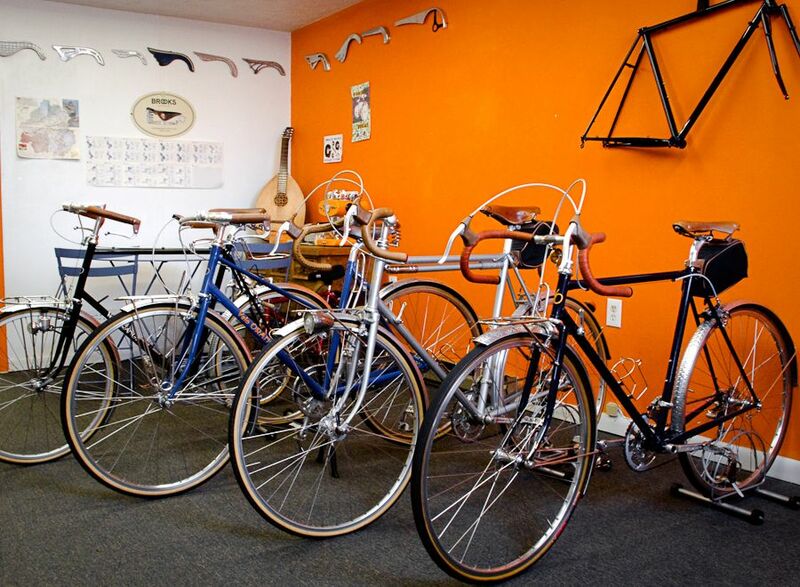 700c rims and tires are available in almost any bike shop anywhere in the world. You'll also gain a bit of extra tire or fender clearance. These two wheel sizes are actually very close. 27" wheels have a bead seat diameter of 630mm, while 700c wheels are 622mm. That's only a 8mm difference in diameter or a 4mm difference in brake reach. This makes conversions simple. First check to see that your brake pad slots, both front and rear, have 4mm of room for downward adjustment. On many bikes conversions are simply a matter of installing wheels with 700c rims and adjusting the brake pads. 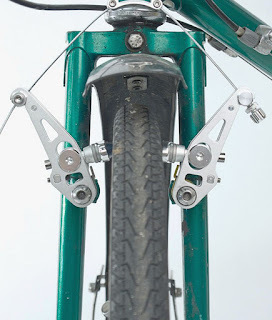 But if the frame/brake combination does not allow sufficient downward adjustment you'll need brakes with longer reach. Since the brakes on most 27"-wheeled bikes are marginal, it would be wise to replace them in any case. Old single-pivot side-pulls are pretty weak in comparison to modern dual-pivot brakes. 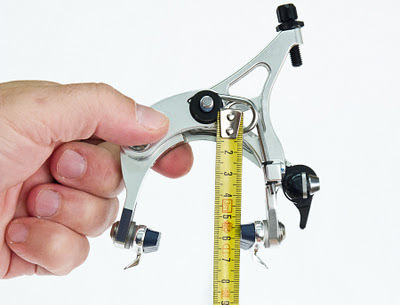 Even the famed Campy Record calipers can't compare to modern brakes such as the modestly priced Tektros. If your brakes don't have sufficient adjustment the first thing to do is determine how much reach is required. Brake reach is simply the distance from the center of the brake bolt to the center of the brake pad. Since the pads can be adjusted up and down the reach for the brake is given as a range. Short reach brakes typically have a reach of 39-49mm, long reach is 47-57mm, and extra long is 55-73mm; always go by the actual reach specs, not by the nomenclature. So far I've written about caliper brakes, but there are some 27" touring bikes with cantilever brakes which typically don't have much adjustment. You can usually switch to Tektro CR720 brakes, which have about 12mm of adjustment, for conversions. I say "usually" because some bike companies were rather casual about correct canti-boss placement. When converting you can either buy rims and lace them to your existing hubs or buy new wheels. With the availability of VO Raid and PBP rims you can retain the classic look of polished rims. We also offer a 126mm spaced freewheel rear wheel and a matching front that are perfect replacements for many bikes. I'm sure that there are some who will want to keep their bikes as original as possible. For a high-end production or custom frame that you view as more of a collectible than a user, this makes sense. Otherwise I would get a second set of 700c wheels for riding and keep the originals for display. VO sells a lot of fenders and gets a lot of questions about installing them. We've updated the fender instructions, both the paper and on-line versions. It's pumpkin season again. Get one that fits in your porteur rack. We'll have these great looking new Dia Compe ENE micro-ratchet shifters in stock in a few months. 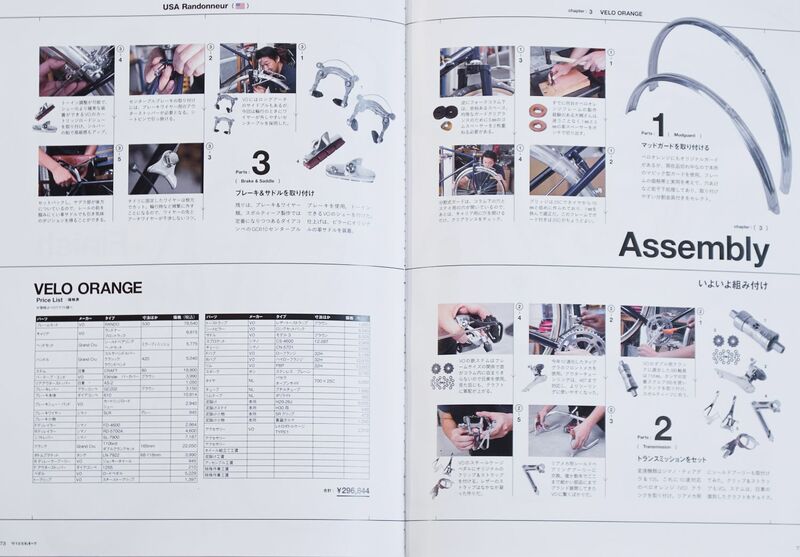 They will be available in both bar-end and downtube version. We think they are the nicest shifters produced today. I ran into Chuck from Velo-Retro at Interbike. His company offers reprints of old bike catalogs as well as some cool t-shirts, and musettes. Worth a visit. 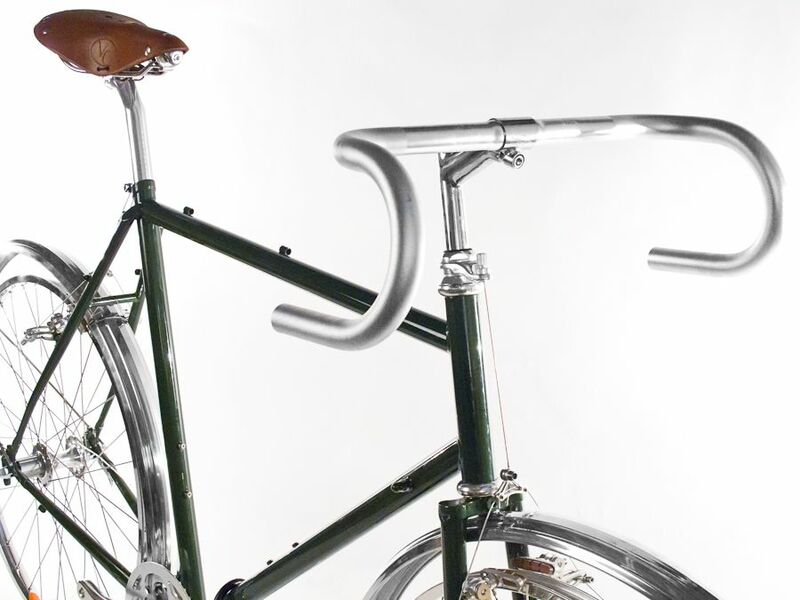 Porteur Handlebars or course handlebars. Your choice. Any other components ordered at the same time are 10% off. Rando maxi build kits are also back. We have 650b wheels again. They are built with the Grand Cru touring hubs and Diagonale rims. Front and rear (in both 130mm and 135mm spacing) are available. 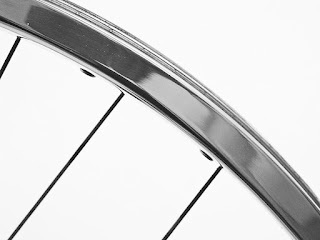 Most other wheels are back in stock, including our fixed and touring 700c wheels. 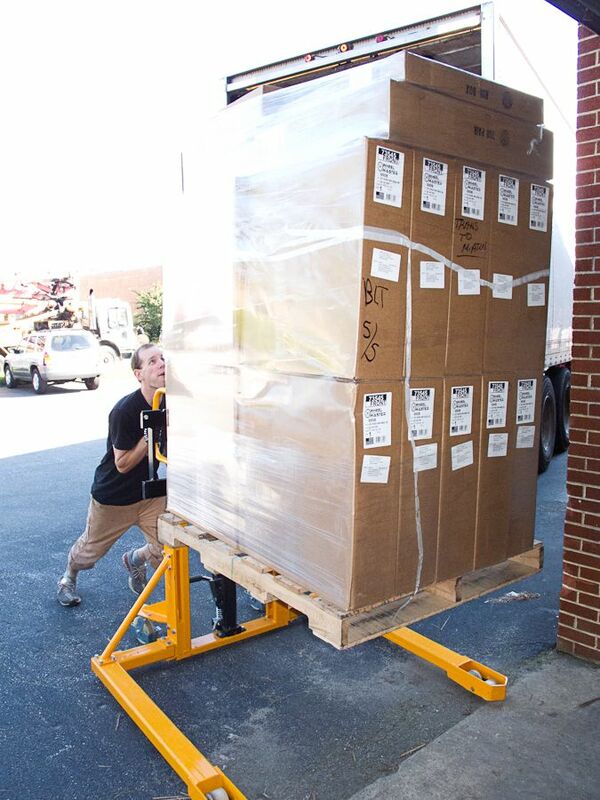 This is a photo of Robert unloading the wheel truck with our new pallet-stacker. It's like a muscle powered forklift. We call him Pepe, our little mule (the pallet-stacker, not Robert). We'd been borrowing a forklift from Chesapeake Light Craft, but felt we finally needed our own. Instead of getting a carbon spewing LPG powered forklift we got Pepe. It's actually a pretty good quad workout pumping that pedal to raise the forks. So Robert may still spew a fair bit of carbon. 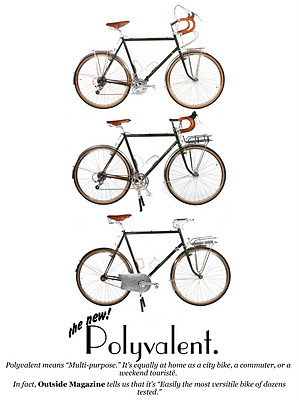 We're working on a print ad for the Polyvalent. Here are our top three versions. Which one do you like best? Or do you have a better idea? Come to think of it, should we even bother with this? Some of us think that VO should only advertise online. Ten years ago I read about 20 magazines and two newspapers. Today I read all periodicals on line (but still prefer paper books). Is print advertising still worthwhile or are we just wasting trees? 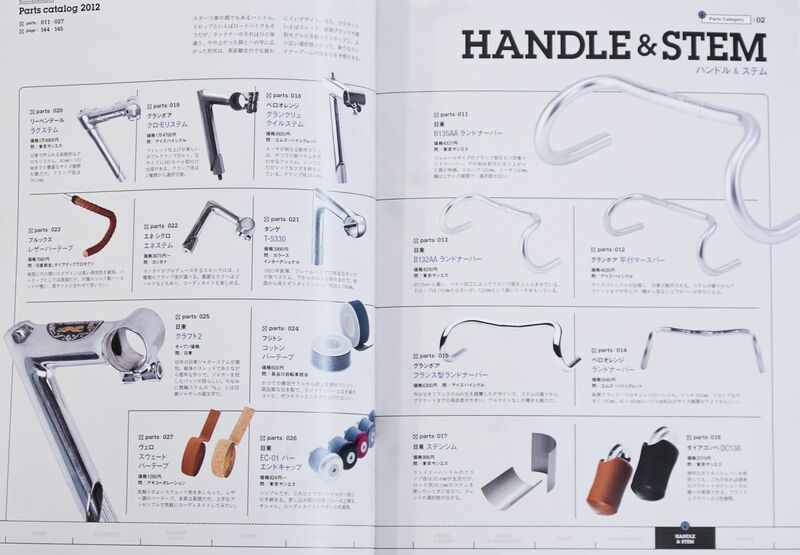 In this magazine, the publisher introduced Mr.Otsuki. 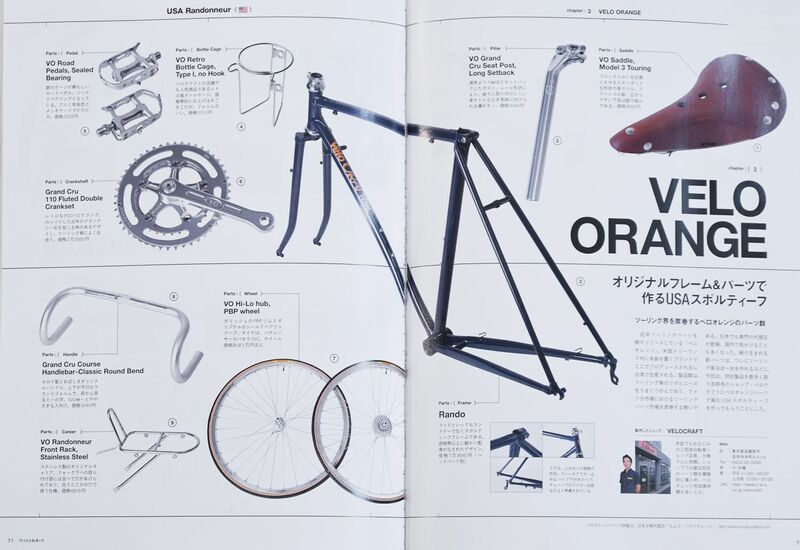 Mr.Otsuki is the store manager of 'Velocraft'.The 'Velocraft' is one of the famous touring bike shop in Japan and Mr.Otsuki is the technical adviser and business partner for my company 'M's Collection'. 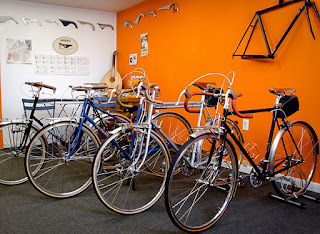 He is very enthusiastic to Velo Orange products.